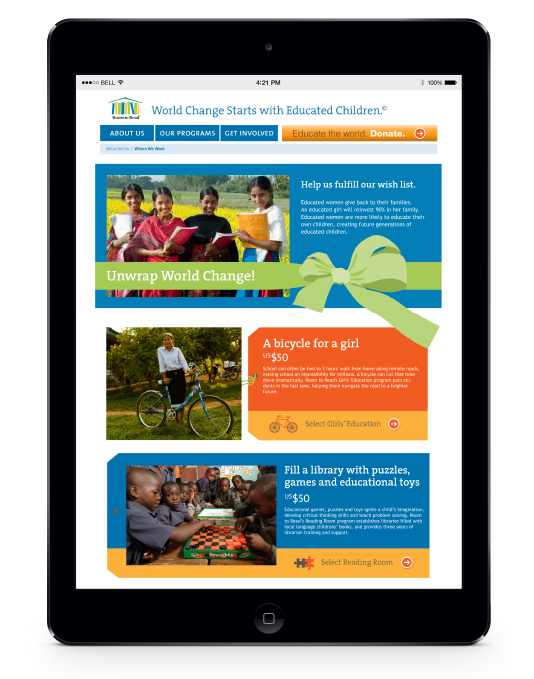 Room to Read’s mission is to change the world by educating children. Our mission is to create powerful tools to help them achieve their goal. It all started with a phone call and a simple assignment. After reading an inspiring article about Room to Read and their plans to grow, we reached out to their director of communications. Following a meeting to determine if our skills were the right fit for their needs, we were given our first assignment: a small mission brochure. But we didn’t think of it as a one-off small project, we saw it as the first building block of what could become a powerful brand strategy to help the organization grow. More than six years later, we’re still working with Room to Read, and together we’ve created the standout brand we had envisioned from the start. Along the way, we’ve designed just about every piece of a nuanced and comprehensive brand. 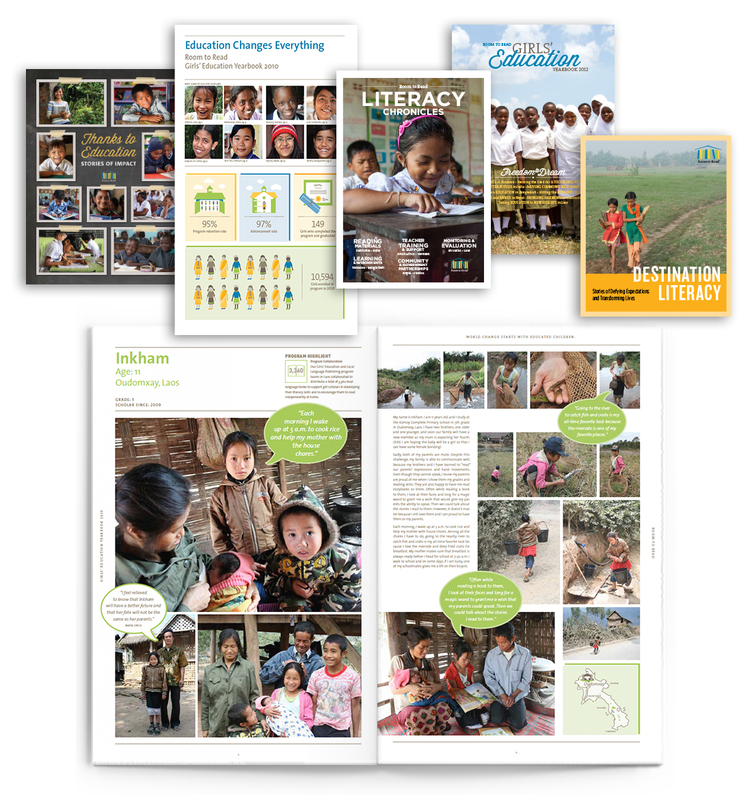 Annual Reports are a vital part of a non-profit’s communications strategy: it’s here that an organization shares with donors the focus of their work, highlights their achievements, and publishes their financial statement. 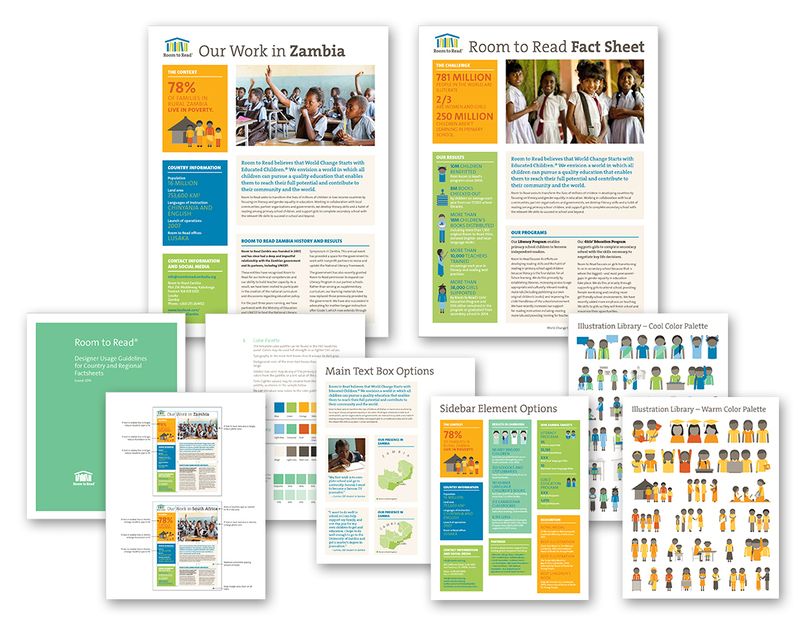 We work with Room to Read to create concepts for each report to express the big ideas and stories of the year. 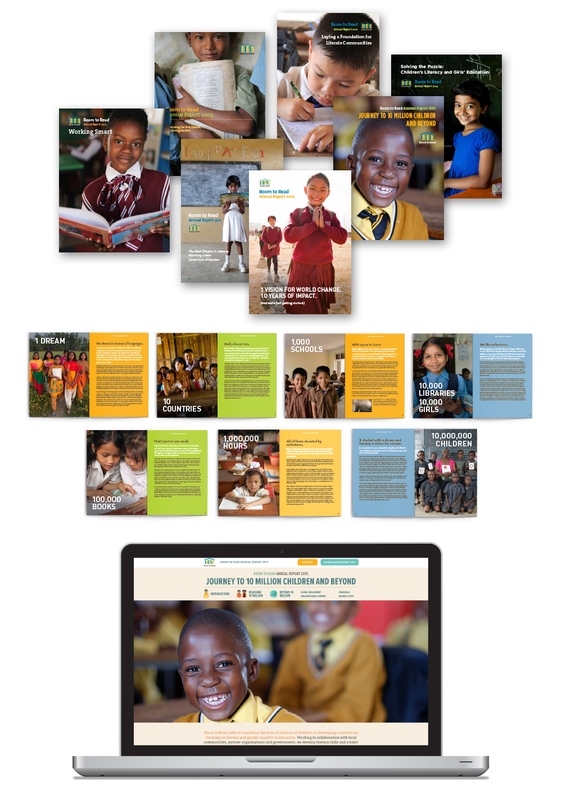 A Room to Read donor once told us that the only reports he reads cover to cover are those we design for Room to Read—and that’s exactly our intention. Take a closer look here. Genuine stories about the people who benefit from an organization’s work are an important part of a communications strategy. When we meet beneficiaries through their stories of struggles, joys and aspirations, we’re able to stand in their shoes and see the profound impact a non-profit can have on their destinies. Room to Read is a believer in following and sharing personal stories of the families and children with whom they work. We create the visuals to engage readers, win their hearts, and move them to get involved. See more stories here. While story telling is an important part of bringing an organization’s work to life, an equally significant factor in building awareness and transparency for donor support is substantiating success through data. Effective non-profits like Room to Read improve their programs by using monitoring and evaluation to fine-tune their work. Our job is to get people to read and understand the data. Through design thinking and imaginative illustration, we turn mundane Excel sheets into easy-to-understand (and even lovable) data visualizations. Take a closer look here. Room to Read was attached to their logo—it was reminiscent of the early days and big dreams of their startup years. But after years of growth, the brand needed to reflect their success and reputation as a leader in their field. We agreed with Room to Read that the concept of their logo—a roof held up by books—still represented their vision and spirit. With small changes, we strengthened the logo to reflect their evolution and to appeal to corporate, non-profit and government partners. A big push for the communications team was to build a robust library of great photography to be used in print, digital and social media. 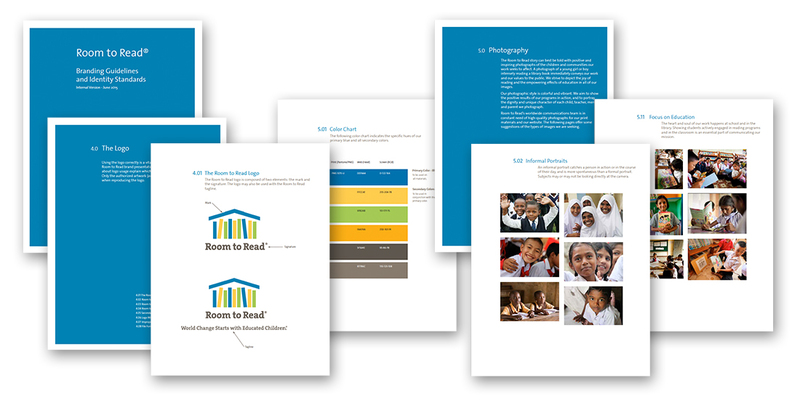 We wrote and designed an extensive section in the brand guidelines to define a photographic approach to convey the stories of the organization and tenacity of the young people benefitting from their programs. As every non-profit knows, partners are critical to success. 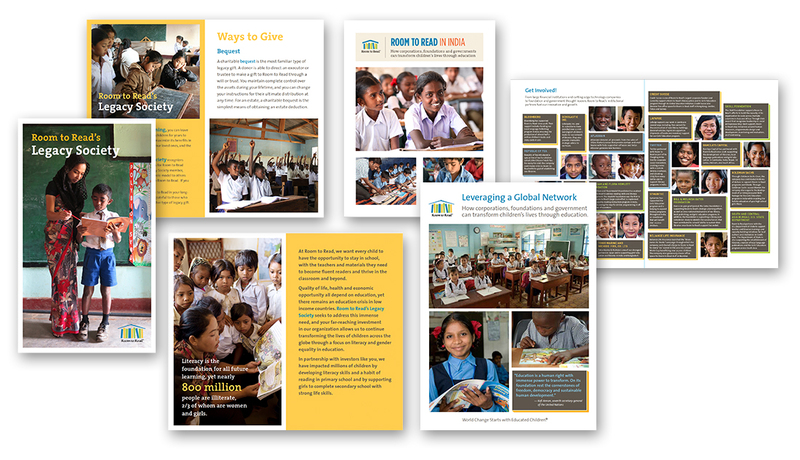 We work with Room to Read’s development team to create informative materials to appeal to corporations and top donors. With direct and convincing design, we present unique partnership opportunities that blend their giving goals with Room to Read’s programmatic objectives. Even with strong corporate partners, most non-profits depend on individual support for the lion’s share of their operating budget. 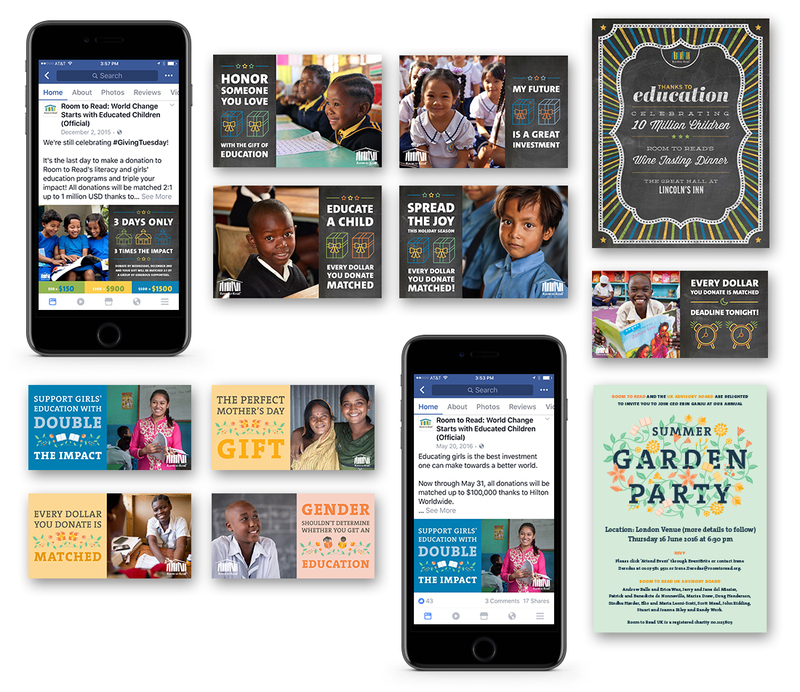 We help Room to Read create social media giving campaigns and fundraising event materials that connect on an emotional level and engage donors to action. Anyone who spends time online knows that video has taken over the internet, and most organizations recognize the benefit of an integrated video strategy. We created the videos below, representing two ends of the production spectrum. The first, which we directed in a small village in Sri Lanka and in Room to Read’s San Francisco office, was professionally scripted, shot and edited. It was used primarily to engage corporate partners who want a deep-dive understanding of Room to Read’s research, monitoring and evaluation practice. The second video introduces young Inkham and tells the day-in-the-life story of her family and studies. This video was created in our studio, using only still photography, typography and graphics. As much as we would like to have a hand in everything our clients do to build their brands, much work is ongoing and produced in-house or by staff and designers in offices around the world. To help keep all efforts on-brand, we design template systems that can be widely used by professional designer and non-professionals alike. When Room to Read’s in house web team wanted to refresh their site, they asked us to envision a visual language, features, functions and architecture for implementation. 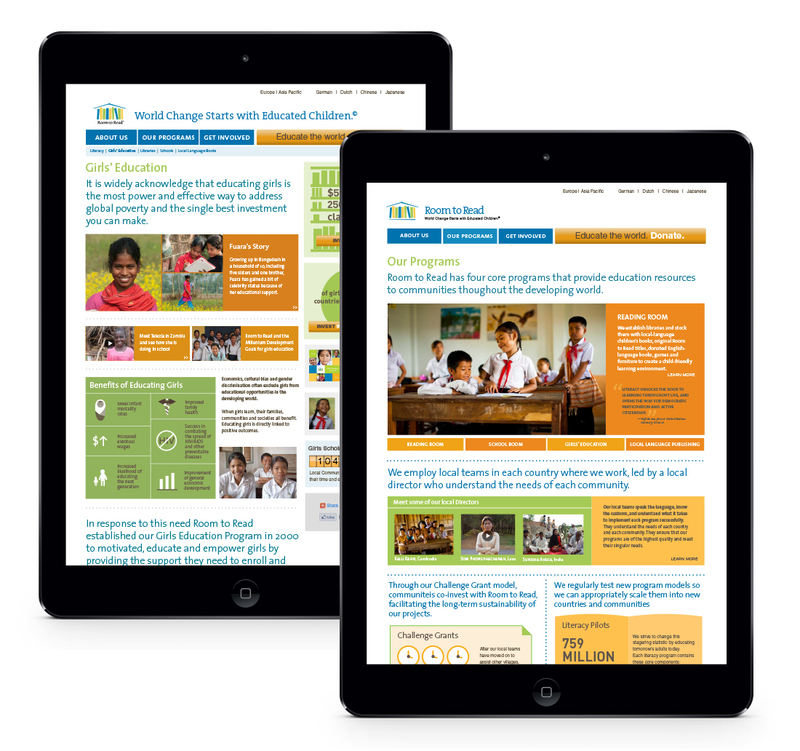 Fact sheets, briefs and research reports are produced regularly, far and wide. We create tool kits, which include templates, user guidelines, graphics and illustration libraries. Armed with our tool kits, Room to Read staff and designers in global offices can create communications that maintain the professionalism and spirit of the brand. When Room to Read launched Room to Read Accelerator to help governments build capacity for better education, one focus of the program was to develop easy-to-implement teacher materials. We helped Room to Read to prototype student report cards, teacher lesson plans and classroom activity plans. The materials were used to gain feedback from teachers in the field to best determine an effective final product. Room to Read produces books for young readers in their local languages, partnering with local writers, illustrators and designers. In some of the countries where Room to Read works, publishing industries are robust, while others have only fledging industries. 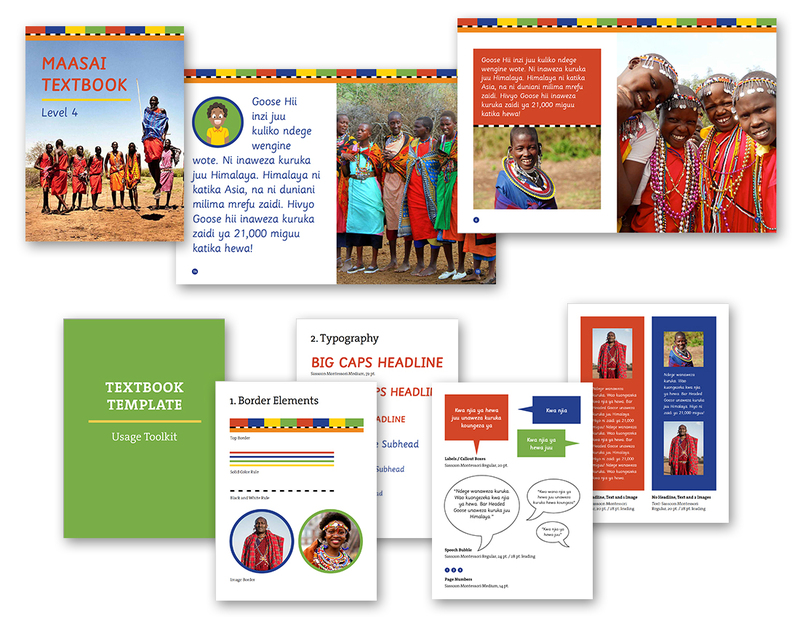 For the global offices that require extra help with book design, we created easy-to-use toolkits, including templates, guidelines and a library of graphic devices to help simplify the book design process. The result is a solution that enables self-taught designers to produce professional-level publications. 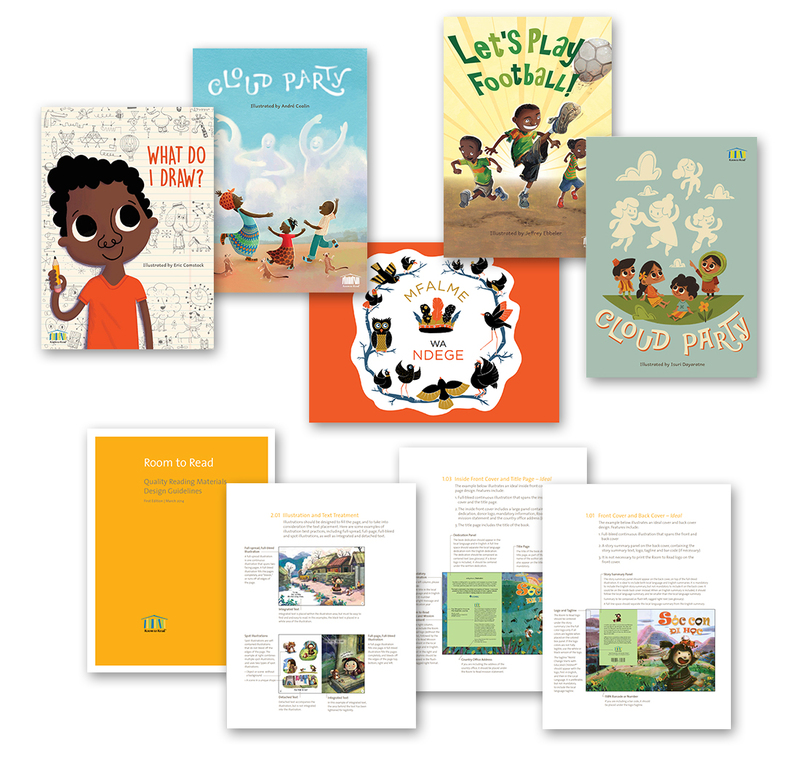 For Room to Read’s global publishing program, we created a template system and user guidelines to ensure that all books produced by the organization maintains brand standards for publishing indicia, copyright, dedication, author bios and design best practices. While the vast majority of Room to Read publications are designed in the countries where they operate, we occasionally have the opportunity to design young reader titles—a favorite project in our studio, as we get to work with the creative stories and illustrations of writers and artists from around the world. We’ve been partnering with Room to Read since 2009 to build an enduring brand that stands out in the world of social change. At every step of the way, we’ve worked side-by-side with Room to Read’s top-notch communications team, combining our expertise to build a communications program that makes everyone proud, and inspires our audience to action.